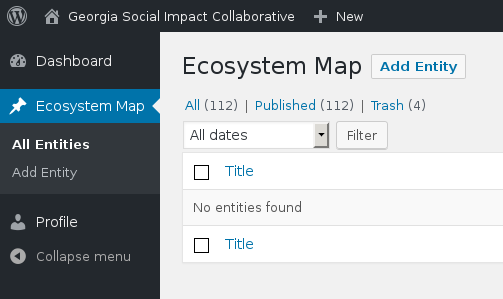 Create an account with Georgia Social Impact Collaborative. After logging in, go to Ecosystem Map then click the “Add Entity” button. 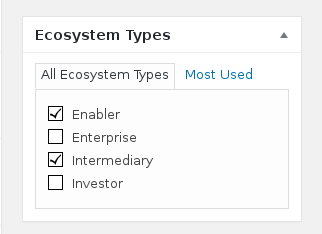 Go to Ecosystem Map then click the Add Entity button. All the information you enter may be made available to users. It’s best to provide as much information as possible to make it easier for others to find you while searching for organizations with compatible interests. Start by selecting the boxes that match your organization’s role in the ecosystem from the choices on the right. The options you select will add additional fields to the form. Your organization will not be made public immediately. It will first be reviewed by the Georgia Social Impact Collaborative. After review, we will publish your organization making it available to all users. When you’re ready for us to review your entry, send it to us by clicking the button on the right. 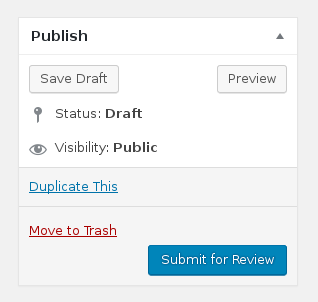 When your entry is ready, click the “Submit for Review” button. Check out the video below to see what some social entrepreneurs and investors have to say about why being being on the map is so important to them! And don’t leave before creating an account.